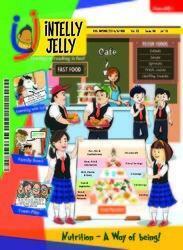 iNTELLYJELLY is a kid's magazine for kids aged 4 to 12 years. It is committed to make earth a better place by increasing the reading habit among kids, globally. At iNTELLYJELLY, we follow UNESCO’s proven methodology and implement it subtly in all our content and themes every month. The magazine offers a platter of vibrant and colourful array of comics, stories, activities to name a few to young readers. iNTELLYJELLY is ever growing and with its national and international acclamation in the first two years from its inception it is proof of our reader's faith in us. iNTELLYJELLY not only gained momentum from prestigious schools across India but also signed an agreement with Reliance Jio. iNTELLYJELLY has also been appreciated by a few eminent personalities like Sir Richard Branson, The Virgin group, UK, Mr. Amitabh Bachchan, and many more. At iNTELLYJELLY, we follow UNESCO's proven methodology and implement it subtly in all our content and themes every month. The magazine offers a platter of vibrant and colourful array of comics, stories, activities to name a few to young readers. The limits are truly endless. 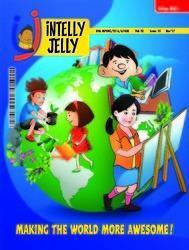 iNTELLYJELLY is committed to increasing the reading habit among kids, globally. Geography involves the study of people. The geography of a region affects the lifestyle of its inhabitants, its culture, and has a deep impact on the social life of the people. Poncho-the flying horse, takes children to various destinations like China, Egypt, Italy and so on –each comic story is a new place-making geography fun for the young ones. Team work is a distinction which better comes with practise. This book present vibrant and well-illustrated comic stories, crafted around team work and nurtures, very subtly, on young readers way of being. Values are an essential part of our being and as studies shows, if embedded at an early years of life, stays there for life-long. 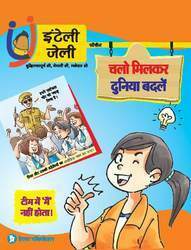 The interesting, vibrant and well-illustrated stories in the book helps steer the children in the right direction and nurture children’s strong moral character. Science complements a child's natural curiosity and helps answer questions kids ask. The Scientific principles such as Gravity, how shadows are formed etc are presented in an extremely simple and cognitive manner, helping children form their own opinions, rather than taking those of others for granted. Research shows that children with a higher Emotional Intelligence are effective leaders in future. Knowing different emotions, and understanding the difference between them and their consequent impact on behavior, is another process which begins in the early years of childhood. An early grasp over recognising different emotions leads to children establishing a better understanding of relationships and developing leadership skills. 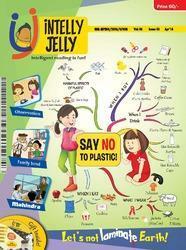 Also, iNTELLYJELLY respects a kid’s opinion in any given situation by encouraging the child to speak his/her mind. We understand that wisdom and intelligence come from both reasoning and understanding and so our articles, stories and features encourage a natural sense of wonder about the world; promote reasoning, creative self-expression. Nothing can replace a conversation with children, especially when they are being listened to. 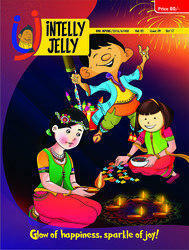 We, at iNTELLYJELLY, create such moments where young readers can share their views, loud and clear. iNTELLYJELLY’s stories, as well as activities ,are crafted in such a way that they improve a kid’s EQ level in a subtle, nonpreachy way. iNTELLYJELLY is committed to working on this in every edition. Manners make the man. This book serves the comics, stories, activities etc, and let young readers explore the right way of being, or if need a specific mention, the right way of interacting with the world. We, at iNTELLYJELLY, believe that observation works better than preachy instructions. We, at iNTELLYJELLY, believe that Superheroes are real, live around us and are accessible to the kids. We also believe that a child’s day-to-day challenges can be effectively eased out by these real life heroes, instead of imaginary ones. Our aim is that kids identify and connect with them as the ‘go to people’. 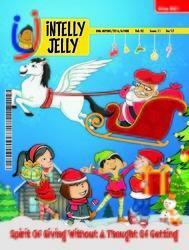 Grab a copy of your favourite magazine, iNTELLYJELLY, this monsoon and go on a magical journey of reading. Enjoy some funny stories, thrilling comic strips and intricate illustrations. Don't miss the adventurous water slide game with your family and friends. Tickle your funny bones with ijoke and iriddle and develop persistence and concentration through interesting activities. 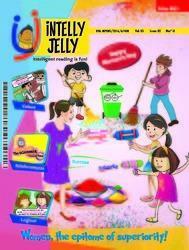 iNTELLYJELLY- Intelligent Reading is fun. By: Maple Press Pvt. Ltd.